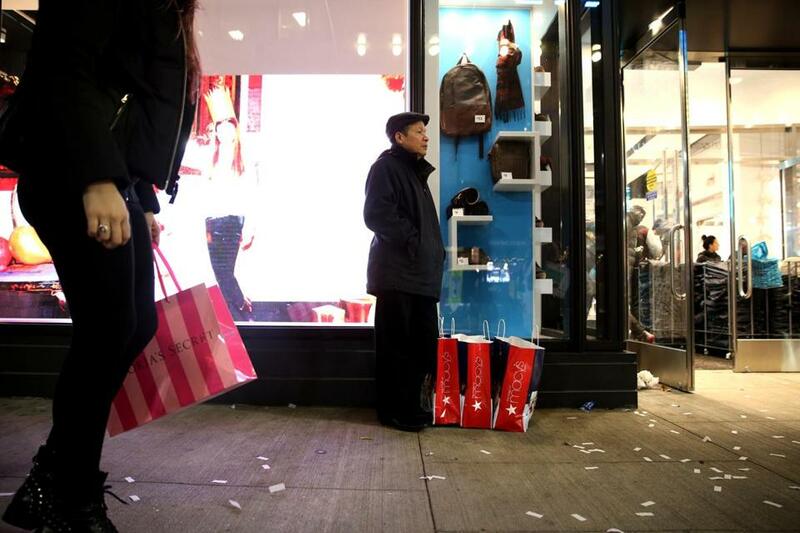 Tom Nguyen, with three bags from Downtown Crossing stalwart Macy’s, waited for the rest of his family to return from shopping on Black Friday. For generations, Downtown Crossing was where you went to see Santa at the Enchanted Village at Jordan Marsh and admire the holiday windows across the street at Filene’s. Those days are long gone, along with Jordan and Filene’s, part of a slow slide into retail irrelevance for what had been a shopping hub. Still, T riders have continued to pour out of the underground station every day, creating a rush of foot traffic that retailers believe can spark a revival if vacant storefronts draw the right mix of national chains and unique shops. Developers, retailers, and shoppers say they are encouraged by the arrival of Primark, an Irish fast-fashion store that picked Downtown Crossing for its first US location. And a new Roche Bros. supermarket and upcoming openings of a boutique hotel and a soaring residential tower promise new life for the once bustling neighborhood, which is still a gathering place for homeless people and rowdy teenagers. Shardae Jobson, 28, of Brookline, has been shopping in Downtown Crossing since the early 1990s and has seen the closure of Filene’s, Barnes and Noble, Woolworth’s, and Strawberries. Downtown Crossing “became a ghost town, the only thing there was Macy’s,” in the former home of Jordan Marsh, said Jobson. “I think with Primark opening it brought life to the area,” she said. After years of stagnation, merchants hope the Millennium Tower and new stores can bring in the customers. Primark’s arrival has given the area “credibility” as a shopping destination and has people excited again, she said. She’d like to see more unique stores — independents or chains that aren’t elsewhere in Boston. Keeping the area distinctive is also a concern of small business owners. They wonder if the big national retailers moving in – a Gap Factory Store recently opened and a Forever 21 is on the way – will make Downtown Crossing indistinguishable from any other shopping destination. Landlords want high rents for still-vacant properties, waiting to land a national chain, while smaller businesses unique to Boston are shut out, said retailer Craig Caplan. “They should be aspiring to make the neighborhood unique and special,” said Caplan, whose Unique Boutique sells Boston-themed apparel from kiosks. His business is looking for a storefront, but Caplan said the rents are too high, averaging $10,000 or $15,000 a month. “If all you put in are these giant massive retailers you could go to anywhere, why would you go there?” he said. The Downtown Boston Business Improvement District said new stores, restaurants such as Yvonne’s, office tenants, and residential developments are drawing people to the neighborhood. “The area is thriving thanks to the growth we have seen during the past several years, and we expect this holiday season to be extremely busy,” said CEO Rosemarie Sansone. Sansone said growth has also been driven by the tech startup community. More than 30 companies have moved into the neighborhood in the last few years, she said. The newest developments are part of a slow climb back for the neighborhood, which suffered a gaping hole for more than five years as plans for the former Filene’s faltered in a failing economy. The new Millennium Tower has plugged that hole. Ben Wegdam, owner of Virginia-based Lou Lou Boutique, chose to open a store in Downtown Crossing because of the immense foot traffic and says it’s a fun place to be. However, he has to allocate more staff hours there than in his other locations to make sure two or three employees are working at a time, for safety reasons. 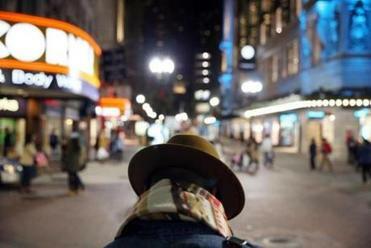 The City of Boston said it is working on an overall plan to end homelessness, according to spokeswoman Bonnie McGilpin. In preparation for winter, the city and its partner organizations identified places for 180 more people, in addition to the existing capacity for 1,470 adults, McGilpin said. Downtown stakeholders said they are excited by the opening of the Godfrey Hotel on Jan. 4 because it brings new people in while preserving some of Downtown Crossing’s character. Hotel developer Oxford Capital Group was drawn to 505 Washington St. because of its proximity to the Financial District, Boston Common, Back Bay, and the Freedom Trail, said general manager Larry Casillo. The development was also an opportunity to repurpose the historic Armory and Blake buildings. A location on Washington Street, which has high foot traffic, made the location desirable as well, Casillo said. And instead of a national chain, the 242-room hotel will feature a café operated by Acton-based George Howell Coffee. Ferguson Herivaux, who owns ONE GIG, a private label boutique at One Bromfield St., said the transformation has been slow, but he thinks perceptions of the area are changing. “It hasn’t clicked as a full, vibrant neighborhood, but I definitely see it happening in the next few years,” he said.